The 36-year-old was arrested Thursday evening for public intoxication after cops in Mountain Home, Arkansas found him reeking of booze and “holding onto a pillar for support” outside a shelter in the Ozark Mountains city. 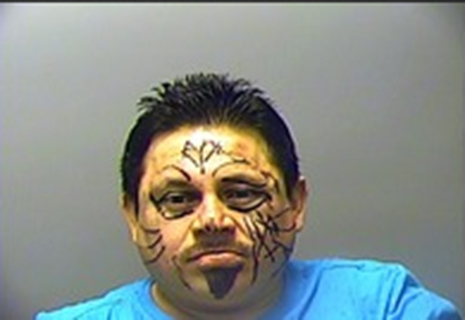 “The offender’s face was covered with permanent marker,” reported a cop who was unaware how Ramirez gained a triangular soul patch and other facial adornments. Ramirez, who had scratches on his face and scrapes on his arms and legs, was booked into the county jail on the misdemeanor charge. He was so intoxicated that police were unable to administer a Breathalyzer test. Ramirez was subsequently released from custody after posting bond.